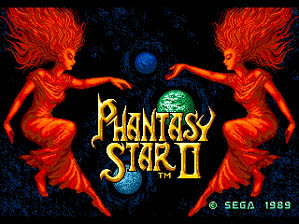 As the second chapter in the Phantasy Star series, no longer can I compare this game solely to Final Fantasy. No, as the successor to the brilliant original, this sequel has a lot to live up to. As it starts out, striking similarities are clear: Snappy sprites, simple battle system, catchy music, and… a four letter limit to character names? Dungeons are no longer first-person, and instead are more detailed compounds and caves like those seen in most 2D JRPGs. However they are just as large and maze-like as ever. Yes, this is good old Phantasy Star. The similarities don’t last long however, as I soon found the story has more in common with Blade Runner than the fairytale story of the original. Only one planet is explored in this one, taking out the unique space-faring of the original. As well, the battle system is not quite as simple as it seems once the variety of playable characters are seen (8 in all). Command options given to allies can become quite dense as later levels are reached. Unfortunately, such complexity is perhaps overblown for a 20-year old RPG. Some of the characters are useless, and others are a waste of time until later in the game. Regular enemies in dungeons can leap from easy to near instant-death. Also, the lack of a save-anywhere feature like the original makes having to redo an hour of gameplay far too frequent than it should be. Note: Actually, there is a secret way to get an item to save anywhere later in the game, but my efforts lead to nothing. The dungeons look amazingly far ahead of their time… Unfortunately, it’s hard to distinguish room from room. This imbalance was my undoing for the game. Perhaps I went into the game wanting it to approach the experience of the original game, or maybe the old school difficulty was simply too much for me. Either way, once it got to the point where I had to check online for every step I made in the dungeons, I didn’t see any accomplishment I could get in completing the game. To be fair, I probably put roughly 30 hours into the game, and made it a fair way passed the surprise; a surprise of which was spoiled for me before I even played the game. I enjoyed most of my time with the game, and it did have a superior battle system to the original, maybe even putting it among my favourite RPG battle systems. Still, as the original “do anything” genre, it’s the balance that is most important and then maybe that magic can be felt again. I guess it does seem like I’m going soft, forgoing challenge in favour of quick fun like Loco Roco 2 (or even random indie games now and then). However, that is not true at all as I’ve put most of my hours in Loco Roco 2 trying the tough challenges (simply beating the game is a cakewalk). I have also been replaying Ninja Gaiden II on the second highest difficulty and played for about 20 hours on the first five chapters! Even if you haven’t played the game, you know its reputation for difficulty. Yes, I suppose achievements are a factor in pushing me forward, but I did the same thing when I continued to play the original Xbox game. No, I think it has a lot to do with the fact that though I may be spending several hours on one checkpoint, at least I’m not redoing a full half-hour each time I die, losing multiple levels in the process like Phantasy Star II. Oh, and the balance, that too.